If your child suddenly stops breathing, what should be your reaction? Will you be able to manage the situation? The best you can do to save the child from the emergency health condition is performing cardiopulmonary resuscitation. To perform the task, you need to be aware of the right steps. Before the medical help arrives, it’s better you start with giving CPR to the child so that he/she can feel better. · Start with delivering five rescue breaths. Ensure that the baby’s head is in safe position. Cover his mouth and nose with your mouth and deliver five rescue breaths. Each breath will need a puff of air from your cheeks and that’s it. · Secondly, give thirty chest compressions. Make use of two fingers to compress the chest of the baby on the breastbone at a rate of 100/120 chest compression per minute. If you can smartly follow these steps, you’ll get to see the best of results. Make sure you’re doing it the right way and your baby is responding to the act. 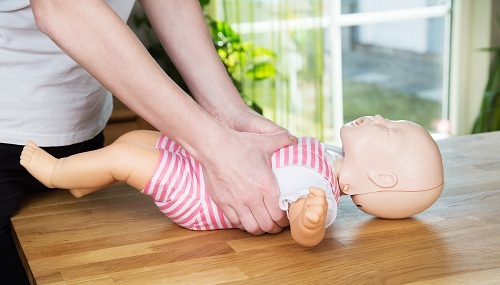 In any circumstances, if the baby is not responding to CPR, call the doctor immediately. It is always better to learn CPR from a recognized institute before implementing the same. Give First Aid in Sunshine Coast, Australia is one of the prestigious institutes, offering quality First Aid and CPR courses. You can register your name today!